Painted by hand in the days before Adobe Photoshop and other digital production and layout tools, these posters were created using innovative techniques usually not seen in these types of works. The techniques used were much different than those used in fine art and are more akin to those used in graphic design. Each poster in the series was painstakingly assembled and required over 400 man-hours apiece to complete. 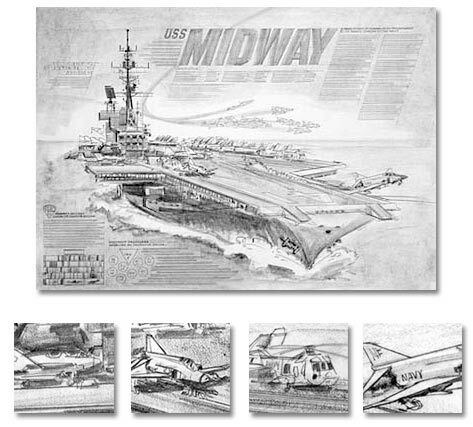 Using the USS Midway as an example, we’ll take a look at the transformation from the photo on the left to the finished depiction on the right. 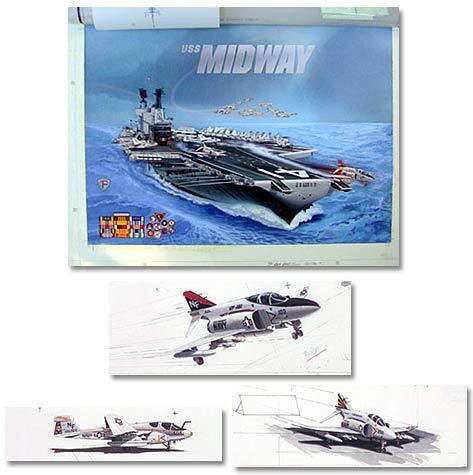 The poster for the Midway, like every poster in the series, began with research into the ship and its history. Part of this process included conversing with the Commanding Officer and other designated personnel to develop a theme. Once the theme was agreed upon, the basic sketch was begun. Below: The final sketch as well as some detailed close-ups. 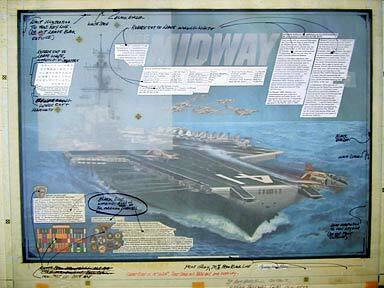 Once a design had been approved, photographs were taken by Mr. Freeman and/or supplied by the Navy to obtain as much visual detail about the carrier as possible. Using acrylics, the ship and its environment were painted by hand. Once the background was completed, work on the aircraft began. Oversized illustrations of each individual plane would be made, based on photographs and physical models (used to measure accurate proportions). This was done to provide as much detail of the planes as possible. These illustrations were then photographically reduced in scale, cut out and pasted into place on the painting. Below: The oversized airplane drawings and the poster during paste-up. Additional details were then added and all the elements of poster were blended together using a magnifying glass, a set of fine paint brushes and touch-up paints. The final stage of assembly was the placement of line art. This included all of the text and in some cases the radar/antennae section of the tower. The finished product was then photographed at a print shop, where negatives and CMYK printing plates were made for offset lithography printing. Below: See the fully-assembled piece ready to be photographed (with notes from the artist). The photographs of the final paste-up were then used to create cyan, magenta, yellow and black plates for lithography printing.